Most categories are split into two pages: Quotes and Sayings. The sayings are from unknown authors/sources. It's a well-known fact that keeping positive, as much as possible, leads to a happier and healthier life. Filling your mind with thoughts of LOVE, PEACE and JOY is a way to accomplish this. The more often you read (and contemplate) positive and uplifting quotes, the more easily they will come into your thoughts, words and actions. This not only benefits your own life, but also the lives of those around you. You will also be radiating your positive energy out to enrich the whole world. Since the early 90's I've collected inspirational quotes and poems, as I always found reading them to be very uplifting. Through following the Law of Attraction guidance of Abraham-Hicks (to focus on what brings me joy) I began this website in 2010. Since then, I have loved to spend practically every day 'working,' in one way or another, on creating this site. You are here to create the world around you that you choose, while you allow the world as others choose to exist also. Photographs: I compiled all of the quote photographs, the vast majority use my own photographs. There are a very few exceptions (noted), where I have used pictures from Pixabay. The author portraits were sourced online. Illustrations: The watercolour and other illustrations throughout this site are by my friend, the wonderful multi-talented artist Sandra Reeves. 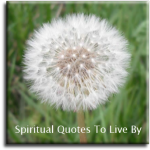 Blog: When I began my Spiritual Quotes To Live By Blog I just wrote about the photo/quotes. At the end of 2016 I changed this to writing an inspirational poem, using each quote as a title and theme. Wordpress Blog: In 2018 I was contacted about sharing my own poems on this site. Due to the positive comments that were received and the fact that I had been thinking of bringing my poems together separate from this site, in July 2018 I re-opened my Wordpress blog to post all of my Inspirational Poems. In 2017 I opened an Etsy shop to sell downloadable products using quotes from this site. I think it's a wonderful way to instantly share more positivity around the globe. I aim to provide more than the majority of other printable shops I have come across on Etsy, therefore, for example, I make '10 Item Poem Packs' and boxed sets of 100 small quote cards using the 100 Quotes pages on this site. Below are some of the available items, selecting the pictures will take you to their listing on Etsy. Underneath, the 'Etsy' wording takes you to Etsy Home and 'SpiritualQuotesTLB' to my shop where you can view all of my products.